The Grossmont Foothillers after winning the Cougar Classic gold bracket championship on Tuesday evening at Kit Carson Park. ESCONDIDO (3-16-16) — It was a great showing for the East County in the Cougar Classic, as five teams made the semifinals including Granite Hills, Patrick Henry, Santana and Valhalla, who made their championship in their brackets, and Grossmont who also made the championship of their bracket. The ultimate prize went to the Foothillers who knocked off some ranked teams on the way to the championship title. The Foothillers definitely crashed the party and look to continue their momentum the rest of the season as they are definitely a team to watch as they opened eyes the last couple of days. GROSSMONT 5, PATRICK HENRY 3 – GOLD BRACKET SEMIS – In definitely the biggest of upsets of the Cougar Classic the Grossmont Foothillers slayed the first of the giants as they defeated the No. 4 Patrick Henry Patriots in the semifinals of the Gold Bracket by a score of 5-3. The Foothillers in the first inning had their opportunity but couldn’t take advantage of the back to back hits by CHLOE CAMARERO (3-4, HR, 2 2B, R) and DESTINY BACON (2-4) as the next three batters would be retired. Patrick Henry in their half of the first would push across a run to lead 1-0 thanks to HANNAH McEWEN (1-2, R, 2 SB) drawing the walk, she would steal second and score due to a Foothiller miscue that would allow CASSIE VAN TIL (1-2, SB) to reach first base. That would be all the damage done as Grossmont was able to get out of the inning. Leading by a run the Patriots added to their lead in the bottom of the third inning thanks again to McEwen who led off with a single and stole second base and would come around to score on a roped single by CRISTIONA CACCAMIESE (1-3, RBI) to lead 2-0. Grossmont, despite trailing, didn’t fret as they were finally able to break through against Henry ace MADISON JAMES in the top of the fourth inning. TAYLOR BAEZ (2-4, R) led off with a single, she would be replaced by LILI FLORES as a courtesy runner. A couple batters later MEGAN MALWITZ (2-3, RBI, 2B) blasted a double that scored Flores to cut the lead 2-1. That was all the Foothillers would score but it was an important run as it meant they were in business. Things would really get interesting in the top of the fifth as the momentum changed to the Foothillers as they put together an inning where they scored 2 runs to take the 3-2 lead. Leading things off was Camarero who was able to get hold of one and blast it over the fence for the solo shot, Bacon flied out to left field for the second out, CARLY PEARSON (1-3, 2 R) drew a walk, Baez singled moving Pearson to third and SAMARIA ROOPE (1-3, R) singled which would score Pearson. The lead wouldn’t last as the Patriots pushed across a run in the bottom of the fifth thanks to a triple by ANDREA WRIGHT (1-3, R, 3B) who would score on a single by Van Til to knot the score 3-3. Both teams would shut each other out in the sixth inning. It would all come down to the seventh inning as Grossmont would get the first crack. Leading things off for Grossmont was Pearson in the top half as she roped a single, and Roope would also single, Pearson went to third and Malwitz would reach on an infield single that would score Pearson to give Grossmont a 4-3 lead. Roope would also come around to score in the inning to make it a two run lead at 5-3 heading into the bottom of the inning. Patrick Henry had one last opportunity but CASSIDY DAVILA who was in the circle for Grossmont had other ideas. She was able to get the Patriots’ SAVANNAH CHAPMAN to pop out to first base for the first out, Wright would hit a hard shot to center and Malwitz would make a spectacular catch as she leaped over the temporary fencing to rob a homerun. It was the third catch of that type for the Hillers. So with two outs and no one on up came James who would end up being called out on strikes looking to end the game. So now with the victory the Foothillers would move on to the Championship game of the Gold Bracket where they would end up facing Rancho Bernardo. GROSSMONT 8, RANCHO BERNARDO 6 (10 inn.) 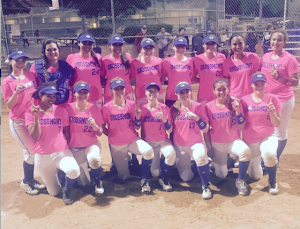 – GOLD BRACKET CHAMPIONSHIP – In the championship game of the Gold Bracket of the Cougar Classic, the Grossmont Foothillers were able to keep the momentum going and defeat the Rancho Bernardo Broncos 8-6 in 10 innings. Questions of whether or not the Foothillers had anything left in the tank were answered early on as they took the early 1-0 lead in the top of the first inning. Again the catalyst for the Grossmont run was leadoff hitter CHLOE CAMARERO (2-4, 2 R, SB, 3B) who reached on an error, she would steal second base, and come in to score on the sacrifice fly by CARLY PEARSON (3-4, R). The Broncos would answer with a run of their own to knot the score when the second batter blasted a solo homerun. The Broncos were able to take the lead in the bottom of the third inning as they were able to push across a run to lead 2-1. The lead would last until the fifth inning when Grossmont was able to tie the score thanks to a leadoff ripped double by MEGAN MALWITZ (2-3, 3 RBI, R, 2 2B) who would come in to score thanks to a single by SAMARIA ROOPE to even the score 2-2. Both teams’ pitching held up as well as the defense which would be crucial as each team had their opportunities in the latter innings. The score would be tied into the end of the sixth. The game would then go into extra innings decided by International Tie Breaker rules where each team would start out with a runner on second base. Grossmont in the top of the seventh inning would go down in order. The Broncos would get their shot in the bottom of the seventh but would be denied as Roope would retire them in order to end the inning. The Foothillers had an opportunity to take the lead as KATIE APPENZELLER who was at second base would reach third thanks to a passed ball but unfortunately would be stranded. Rancho Bernardo would also go down in order in the bottom of the eighth. So heading into the top of the ninth inning, with both teams just shutting each other down, Grossmont finally was able to break through. Camarero who was the runner at second moved to third when Pearson was able to lay down the perfect bunt and beat the throw for the infield single. TAYLOR BAEZ (1-3, R) knocked in Camarero with a single, Malwitz would drive in both Pearson and Baez when she rocketed a shot to left field that ended up going out of play for a ground rule double. The fans in the stands for Grossmont went bonkers when all three runs came in. With the runs the Foothillers now took a 5-2 lead. Rancho Bernardo was finally able to get out of the inning without any further damage. Unfortunately the lead wouldn’t holdup as the Broncos didn’t fret and were able to answer with three of their own runs to again tie the score at 5-5. Grossmont was finally able to get out of the inning but not before the damage had been done. It was getting really late. In fact so late that the lights in the sports complex were starting to turn off one by one. But this didn’t bother the Foothillers as they started the tenth inning. Taking second base as the runner was KAILEY DANIELS, she would be bunted over by AMBER ALLMAN who was safe at first as well. Next up for the Foothillers was Camarero who took the 2-0 count and smashed a triple that scored both Daniels and Allman which gave Grossmont a 7-5 lead. Grossmont added another run as Camarero would come in to score on a wild pitch to make it 8-5. The Broncos finally got out of the inning but not before the real damage was done. Grossmont could feel it on their fingertips as they were three outs away from claiming the championship. It wasn’t just the team but also the fans who stood and cheered. So in the bottom of the tenth inning, the Broncos looked to extend the game. The Broncos would push across a run in the inning to make it 8-6 and it looked like it would be déjà vu all over again in that they would tie it and send it into the 11th inning. However Roope would retire the next three batters and that was all she wrote for the game. Grossmont had accomplished what no one had thought they would in that they defeated the giants of the county in No. 7 West Hills, No. 4 Patrick Henry and North County power and Division One Rancho Bernardo all in consecutive days to claim the Gold Bracket Championship. VALHALLA 10, LA COSTA CANYON 7 (4 inn.) – BRONZE BRACKET SEMI – The Valhalla Norsemen took on the La Costa Canyon Mavericks in the semifinals of the Bronze Bracket and were able to come back and hold on for the 10-7 victory in 4 innings. La Costa Canyon shot out of the gate early on as they were able to score three runs in the top of the first inning to lead 3-0. Valhalla would answer with a run in the bottom of the first, BRANDI KOHEL led off with a walk, she would come around to score as SAM GREEN ripped a double to make it 3-1. The Norsemen in the bottom of the second inning would really open things as they plated nine runs in the inning to take a 10-3 lead. Multiple hits including a bomb over the fence by Green would be the nature of the offense in the inning as Valhalla batted around and everyone scored. Things would get interesting as LCC would score three runs in the third inning to cut the lead to 10-6. However the Norsemen would get out of the inning. The Mavericks would tack on their final run in the top of the fourth inning to make it 10-7. That was the closest they would get as LILY METSCH would get out of the inning to end the game. She would get the victory as she tossed a complete game. MIRA MESA 7, VALHALLA 5 – BRONZE BRACKET CHAMPIONSHIP – In the nightcap of the Bronze Bracket the Valhalla Norsemen would take on Mira Mesa for the championship and unfortunately would drop the contest 7-5. Taking the circle for Valhalla was TORRI BASSETTE and she started well as she retired Mira Mesa in order in the top of the first. Valhalla in their half of the first got on the board as they were able to score three runs to take a 3-0 lead. BRANDI KOHEL drew a leadoff walk, she then stole second base, SAM GREEN drew a walk, KENNEDY LABSHERE laced a single, Kohel scored and Green would score on the single by RACHEL SHELLSTROM. Despite this Mira Mesa would finally get out of the inning. The Marauders would get on the board and cut into the lead as they scored a run in the top of the third inning. Valhalla would answer back with a couple runs of their own as ANGELINA GUTHRO and SARAH BOTTE both scored in the bottom of the fourth inning to make it 5-1. Mira Mesa would score again in the top of the fifth to make it 5-2 and would eventually knock Bassette out of the game. Replacing Bassette was LILY METSCH in the top of the sixth. Unfortunately the Marauders would take advantage of their opportunities and score five runs to take the 5-2 lead. The lead would hold as in the bottom of the sixth despite getting a runner on thanks to a double by Kohel with two outs, the next batter Green would be retired giving Mira Mesa the victory. CARLSBAD 11, SANTANA 6 – SILVER BRACKET SEMIS – The Santana Sultans took on the Carlsbad Lancers in the semifinals of the Silver Bracket of the Cougar Classic but unfortunately dropped the contest 11-6. The Lancers struck first with three runs in the top of the first inning to take the early 3-0 lead. Santana was able to cut into the lead as they scored a run of their own in the bottom of the first thanks to a double by MACKENZIE BENNETT who would be replaced by ERICA REID as a courtesy runner, Reid would come around to score on a MADDY MENDEZ single to make the score 3-1. Carlsbad would score a couple of more runs to lead 5-1 in the top of the third inning thanks to multiple hits. Santana would answer in the bottom to make it 5-2 as CASSIDY MATTHIE drew a walk, Bennett singled, RACHEL WILSON knocked in Matthie with a blast of a double to make it 5-2. Carlsbad over the fourth and fifth innings scored six times to lead 11-2. The Sultans down to their final opportunity looked to get things going in the bottom of the fifth. Things looked good as REID led off with a single, unfortunately the next batter LEXI CHAVARIN-MIRANDA grounded into the easy double play. So with two down things didn’t look good for the Sultans. However ASHLEY MADRIGAL was able to reach on an error and ALEXIS BERRY drew a walk, SHELBY HOLMQUIST came in to pinch hit for Mendez and drew a walk moving the runners up, the next batter CELINE MENARD who came in for JORDAN TEEGARDEN lined a single to center that scored Madrigal and Berry. An error by the center fielder allowed Holmquist to score and Menard to advance, SOPHIA MARTORANA walked, SYDNEY BENJAMIN cranked a line drive double to left that scored Menard to make it 11-6. That would be the last run obtained as NICOLE PENTON MARCH struck out. RANCHO BUENA VISTA 1, GRANITE HILLS 0 – The Granite Hills Eagles drew the Rancho Buena Vista Longhorns in semifinal action of the Silver Bracket and unfortunately drew a hard luck 1-0 loss. Taking the circle for the Eagles was BRENDA RUSHING who tossed a complete game while giving up one earned run and striking out one in the loss. Unfortunately the offense just couldn’t get it going to give any type of run support as they were limited to 2 hits on the day. RACHEL RILEY would have one of the hits on the day for the Eagles. The Longhorns would score what ended up being the only run of the contest in the bottom of the fourth inning. CHRISTIAN 18, MAR VISTA 9 – In another slugfest, the Christian Patriots hosted the Mar Vista Mariners in non-league action and were able to double them up 18-9. The Patriots wasted no time as they were able to score in the first inning thanks to a single by SILENT RAIN ESPINOZA (3-3, RBI, 3B, 2B), she moved to second on a passed ball, moved to third on the sacrifice bunt by ASHLEY CARTER (RBI) and would score on a wild pitch to give the Patriots a 1-0 lead. Mar Vista in the top of the second inning would even the score at 1-1 as they were able to push across a run. Christian would retake the lead on a walk by COURTNEY SKJERVE who stole second and scored when Espinoza tripled to make the score 2-1. They would tack another run on when ANNA SHERBURNE (2-4, 2 RBI) singled to score Espinoza and make it 3-1. The top of the fourth inning would see an offensive explosion for the Mariners as they scored six times to take a 7-3 lead. However that wouldn’t last long as in the bottom half thanks to a 2-run single by SHANNON MCMAHON (2-4, 3 RBI) and a 2-run triple by ELLE LINDBLAD, the Patriots retook the lead 7-6. They would rack up five more runs in the bottom of the fifth to extend their lead to 11-7. The closest the Mariners would get would be in the top of the eighth inning when they scored two more times to pull within 11-9. However, Christian scored eight more times in the bottom of the eighth. The big blow came off the bat of LAUREN SHERBURNE (2-4, 4 RBI, HR) who blasted a 3 run dinger. SERRA 5, ESCONDIDO CHARTER 4 – The Serra Conquistadors held onto beat visiting Escondido Charter 5-4 after various lead changes. Serra was able to score 2 runs in the bottom of the first inning thanks to a double by DARBY TIBBETTS (1-3, RBI, R, 2B), she would score on a AMBER WOZNIAK (2-4, 2 RBI) single and she would score on a MEGAN POOLE base hit. The Conquistadors led 2-0. Plenty of runs would be scored in the second inning by both teams. Escondido Charter started things off with three runs to take a 3-2 lead. However that wouldn’t last as Serra was able to score three of their own to retake the lead 5-3 thanks to an RBI single by Wozniak that scored KRISTA RASK. A late run by Escondido Charter in the top of the sixth would pull them within 5-4 but that’s all they would get as Tibbetts shut them out in the final inning to preserve the victory. HORIZON 8, MONTE VISTA 7 – The Monte Vista Monarchs hosted the Horizon Panthers and unfortunately dropped a hardluck non-league contest 8-7. The Monarchs scored four runs in the bottom of the first inning to lead 4-0 early on. They would add on two more in the bottom of the fourth inning to lead 6-0. Horizon finally got on the board in the top of the fifth to make the score 6-1. Monte Vista would add another run in the bottom of the sixth inning. Things all of a sudden got interesting in the top of the seventh when with one down as EMILY BODTKE who had been cruising along for the Monarchs all of sudden lost the mojo, the Panthers exploded for seven runs to take the 8-7 lead which they would hold onto. The Panthers took advantage Monarch miscues in the seventh which helped them score their runs. A couple of Monarchs had multiple hits including GENNA HENDERSON who went 3-3 and scored a run, CYNTHIA VALENCIA went 3-4, scored 2 runs and drove in 2 runs. Bodtke also helped her own cause as she went 2-2 and drove in a run. CALVIN CHRISTIAN 12, MOUNT MIGUEL 0 – Mount Miguel took on visiting Calvin Christian in their home opener in non-league action and unfortunately came out on the wrong end of a 12-0 loss. Some great highlights defensively by the Matadors showed they have a great future ahead of them. Some of those highlights included a CHEYENNE ROLLES catch in the outfielder and spectacular throw home to get the runner. The left side of the defense for the Matadors made some key plays as well. Unfortunately, offensively they couldn’t get anything going as the pitcher for Calvin Christian tossed a no-hitter.